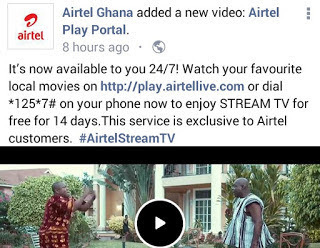 For my Ghana brother , this one is strictly for you guys , as Airtel Ghana is giving out 14 Days of free online video streaming for Airtel subscribers in Ghana . This is not a cheat , it is a exclusive offer . This offer allows you stream videos online for free for 14 days , you can get this offer by dialing *125*57# or login to play.airtellive.com . According to Airtel you can use it on Android devices and can stream videos , but you can also bypass and use it to power other apps using VPN . The Airtel free video websites. Dial *125*7# on your smartphone to activate this plan . Then after open your browser and visit play.airtellive.com . Now start watching videos as you live .... start flexing . meaning Nigerian cant use it?